The first teaser trailer for Pirates of the Caribbean: Dead Men Tell No Tales dropped last night to a mixed variety of opinions. It’s easy to see why there have been some difficulties drumming up enthusiasm for this latest (final?) entry in the series. By the time it is released in May, it will have been almost fourteen years since The Curse of the Black Pearl took audiences by storm and earned Johnny Depp an Oscar nomination, and six years since Jack Sparrow’s last outing in On Stranger Tides. Dead Men Tell No Tales has had a troubled production, between rewrites, a ballooning budget (after the box office failure of The Lone Ranger, no less), and a plethora of issues involving Depp including illegally importing his dogs into Australia during filming, an off-set injury which required surgery and a delay in filming, and now his public split from wife Amber Heard along with allegations of domestic abuse. It’s easy to see how people might be a little tired of Pirates of the Caribbean, despite the seeming popularity of the series and its characters. It is possible to love something while simultaneously not wanting it to continue, and that’s an opinion I’ve seen repeatedly online the past few years. On the other hand, I love Pirates of the Caribbean. No seriously, I really love it, just read this ridiculous 2-part analysis I did of the original trilogy, or this, this, this, or this. I have the Black Pearl’s Jolly Roger on a ring I wear at all times, as well as using it for my Twitter icon. I’ve spent way too much time and energy pouring my heart into the series, and I have no interest in seeing it quietly fade away. I have relatively high hopes for Dead Men Tell No Tales, despite having mixed feelings about On Stranger Tides, and what I’d really like to see is for the upcoming film to correct some of the missteps of the last. On Stranger Tides is fun, it has some great moments and characters, and I know people who cite it as their favorite in the series, but to me it was somewhat lacking. My biggest problem was having the story set squarely on the shoulders of Jack Sparrow. Jack (despite Depp’s Oscar nomination for Best Lead Actor) was a supporting character in the first three films, and the story we were all watching was really that of Will and Elizabeth, which came to a perfect conclusion in At World’s End. Don’t get me wrong, Jack plays a major role, and his character was explored in great depth, but still it was never his story. On Stranger Tides tries to be Jack’s story, but it’s clear to me that Jack is not the right sort of character to carry a film. He works much better in a supporting role, messing things up, chasing his own ends, and generally being a mystery. On Stranger Tides has other issues as well, including too many new faces, creatures, and plot elements, some odd choices in cinematography and direction, a lack of memorable action sequences, and a story that never quite new what to say, but my main complaint is the way it seemed not to understand how best to use Jack. All that is to say that I hope Dead Men Tell No Tales does better. It’s impossible to say whether it will from this short teaser, but we can infer a few things and maybe make a few guesses, as well as take a look at what it does show. The trailer opens with a pursuit, with one ship chasing another into a fog-covered island cave. Inside the cave we watch as a group of Royal Marines are slaughtered by a dark and deadly force led by a new villain. This is Captain Salazar, played by Javier Bardem, and his band of ghost pirates. I’m already digging the design and visuals of these pirates, as gruesome as they are, because they’re much more interesting than Blackbeard’s crew of zombies (remember them?). It seems that as ghosts, these pirates retain the appearance of their dead bodies, a far cry from those filling the boats headed to the other side in At World’s End. We’ve got a guy missing most of his head as well as other mangled forms, and in our first look at Salazar his hair seems to float as though he were still at the bottom of the sea. We also catch a glimpse of what appear to be medals on his chest. We then get to see Henry (Brenton Thwaites), who is locked in the ship’s brig, looking out of place. He’s wearing a naval jacket that looks far too big for him, and here’s where my one and only theory comes into play. We know that Will Turner will be in the new film, and from statements made by Orlando Bloom the relationship between Will and his son will be at the forefront of the film, serving as a bit of a soft reboot for the franchise. My guess is that Henry, whose last name we don’t know, is Will’s son who has set off to find his father, and was captured by the Royal Navy after doing something vaguely piratey. There have been quotes describing Henry as trying to break a curse to reunite with his father, though Thwaites has said his dad is Davy Jones. But I expect that’s a red herring and it’s really Will, currently serving the same role Jones was charged with by Calypso. Henry is confronted by Salazar, who is after Jack Sparrow. And it’s here that we get our first good look at the ghost pirate, spitting blood and looking horrific. So Henry is now tasked with tracking down Sparrow in order to deliver Salazar’s warning. In the process he’ll presumably encounter Will, Barbossa, Gibbs, Scrum, Marty, and Murtogg and Mullroy, all of whom will be returning. I also imagine he’ll fall for the young, feminist scientist Carina Smyth, played by Kaya Scodelario. And, I guess, Paul McCartney, who is also rumored to be in it? The trailer then pulls backward from the island, but not before giving us a glimpse of a mysterious constellation. The constellation is repeated on the film’s logo, a new take on the famous skull and cross that has symbolized the film. The constellation is repeated there on the left side of the skull, and seems to be symbolizing Poseidon’s Trident, an artifact that gives the bearer power over the seas (and which also is on the skull’s forehead). All in all, it’s a fun little glimpse at the film that tells us next to nothing, but does give us a look at the new villain as well as the general style brought by the saga’s new directors. I think it’s a smart move to keep Jack (and Will and everyone familiar) out of this trailer. It gives people time to ease back into the series without the feeling of “well, here’s more of the same”. Javier Bardem is popular enough to carry the trailer on his own, and he certainly has played many memorable villains. There are enough little clues for people who want to tear the teaser apart, but is otherwise pretty straightforward. I’m sure the next trailer will give us Jack in all his glory, with a larger look at the plot as well as a hint at what Jack’s been up to since (presumably) rescuing the Black Pearl from its bottle. But for now, I’m more than happy for him to remain the stuff of legend, something for others to pursue rather than putting him front and center straight from the beginning. And I can’t deny that hearing “A Pirate’s Life for Me” once more gave me chills. What do you think? Are you excited for Dead Men Tell No Tales, or would you rather Disney send the franchise to Davy Jones’ Locker? Did the teaser pique your interest, or did it fail to win you over? Are you excited to have Will Turner back? Was keeping Johnny Depp out of this first trailer a reflection of his recent appearances in the news? What do you make of Javier Bardem’s Salazar and his ghost pirate gang? Is there any way that Henry doesn’t end up being Will’s son? What do you think landed him behind bars? (Impersonating a naval officer, given his outfit?) Can Pirates 5 ever live up to the legacy of the first film or initial trilogy? Are you interested in this film being a bit of a reboot, allowing the series to start fresh? Do you think, as Depp does, that this will be the final outing? Who is your favorite pirate? Let me know in the comments! This entry was posted in Trailers and tagged dead men tell no tales, Disney, dmtnt, Jack Sparrow, Pirates of the Caribbean, potc, Screencaps, Trailer by lovepirate77. Bookmark the permalink. 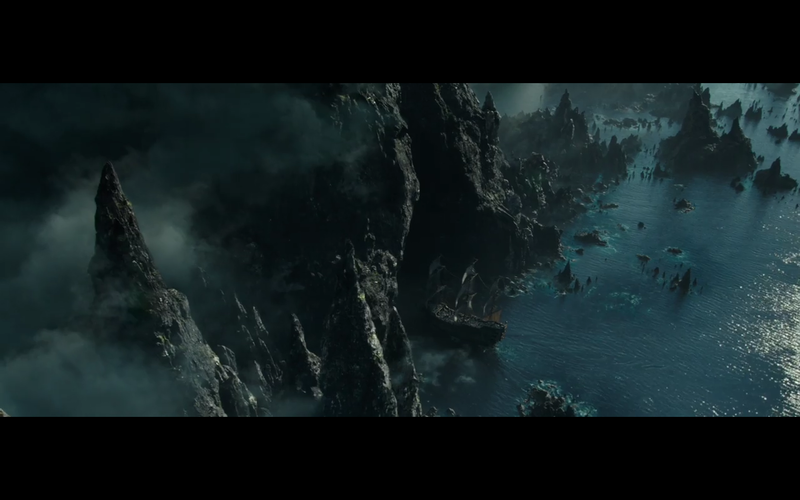 The teaser just made it feel like every other POTC film to me. I’m not overly excited about the film, but I am curious. That guy could be Orlando Bloom’s son, but how many years after the third film does this film take place? I don’t like the CG of Bardem and the ghost pirates. Their faces seem so fake and ready to fall off their bodies. Uh, well, I loved the Pirates films, they introduced me to some real tall ships, and about half a dozen real sailors who’d sailed on the Interceptor, aka Lady Washington. So I’ll go see this for sure and hope they don’t just run our a tired retread but do something fresh with it. We always need a good pirate movie.